Gator Tail, the original belt-driven surface drive engine, is the one that changed the game. From a research project in college, this technological marvel has grown to drive the market in little over a decade. The next decade has begun with the evolution of our 37 and 25 EFI engines. These engines will prove to be the most reliable way to get you places you never thought possible. Allows you to run all your favorite electronic accessories. Allows proper operation data and precise maintenance windows. Engine comes standard 4250 rpm limiter, protects against over revving. Vibration Reducing bushing makes longer runs easy. 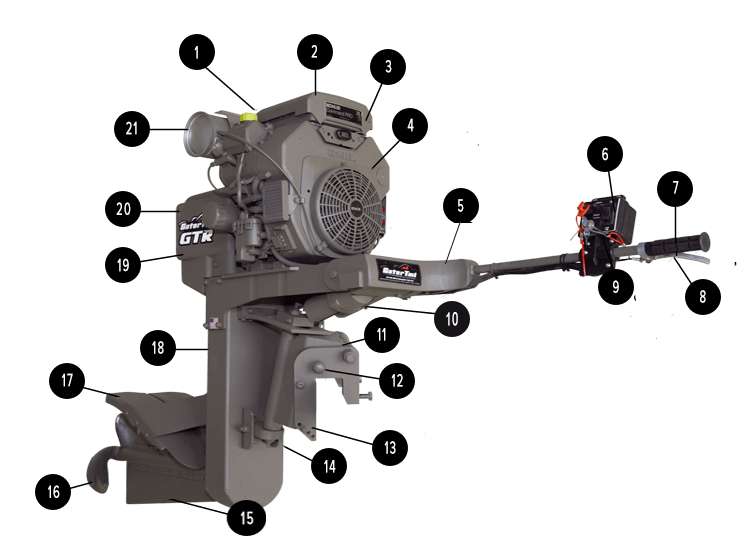 Start, Trim, Kill Switch and Gear controls all located on tiller arm for easy access and operation. Enhances safety and control standing up or sitting down. Weather-proof throttle ergonomically designed for comfortable and reliable operation. Durable, commercial strength switch for reliable and all weather and all condition operation. Allows reliable trim performance in all conditions. Allows each GatorTail engine to be custom mounted to individual hull for maximum performance. 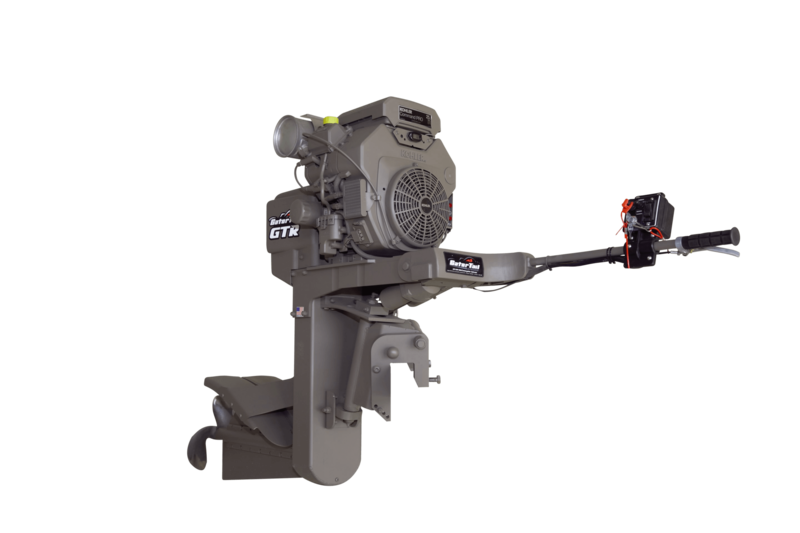 Allows engine to be tilted out the water easily for maintenance, storage or while trolling in the shallows. Allows engine to freely kick up on impact with no effect on trim unit. Allows engine to turn and rotate easily for safe and comfortable operation. Separate Lube Chambers provide extra protection for bearings and weedless profile allows enhanced mobility. Maximizes thrust for reverse power and keeps mud and water splash-backs to a minimum. GatorTail's belt driven technology is with you forever, we guarantee it. Break a belt, we'll give you another one... forever. 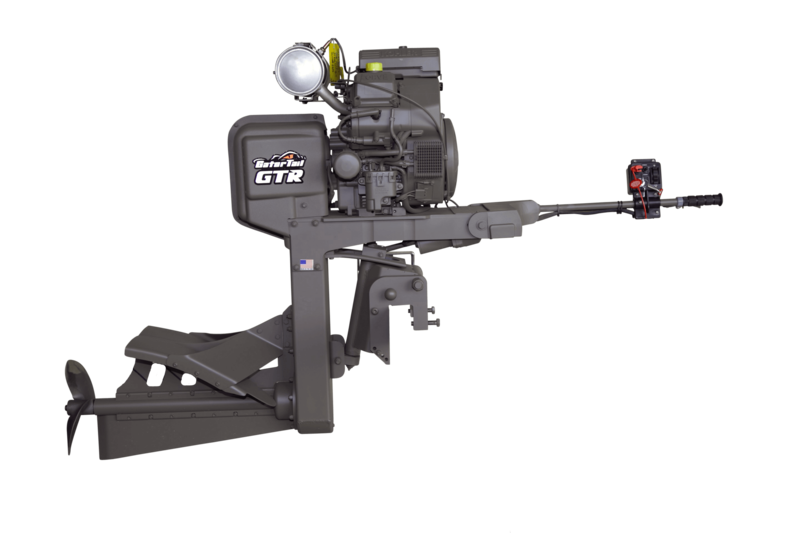 GatorTail's exclusive design provides powerful and reliable reverse, rated up to 250 hp. Forward and Neutral gears provided smoothly and reliably by GatiorTail electric clutch. 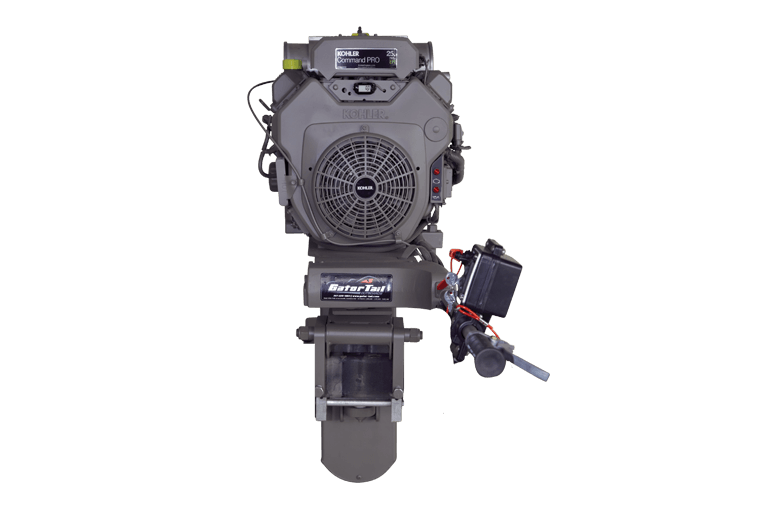 A seamless transition to hop between your bay boat or bass boat to your mudboat. The ease of operation and smooth transition will now be reﬂected in your GatorTail. This new technology enhances the safety, engine protection, and performance of our ﬂagship engine.